I arranged to go fishing for some Carp with my young buddy Jordi which I was really looking forward to. On arrival at Jordi’s house he decided that instead of bringing a rod, he’d bring his camera. It seemed that since we had last been fishing some years ago he had a new love – filming. He loves airplanes and I was surprised to see the number of hits on his You Tube account (1.5 million!). This guy is talented for 15 years old. Check Jordi’s work here. I wasn’t sure what content Jordi was hoping for so we just messed about and what you see below is an ad-hoc film taken with zero prep, zero thought, and no real purpose… it’s only Jordi’s editing that makes it watchable! As I said on the film, the condition of fishing in the pond was that I had to remove, not return any fish caught due to the volume of fish in the pond. This was no bad thing as I was keen to cook and eat a Carp as I had heard both good and bad things. I gutted it where I caught it and took it home. 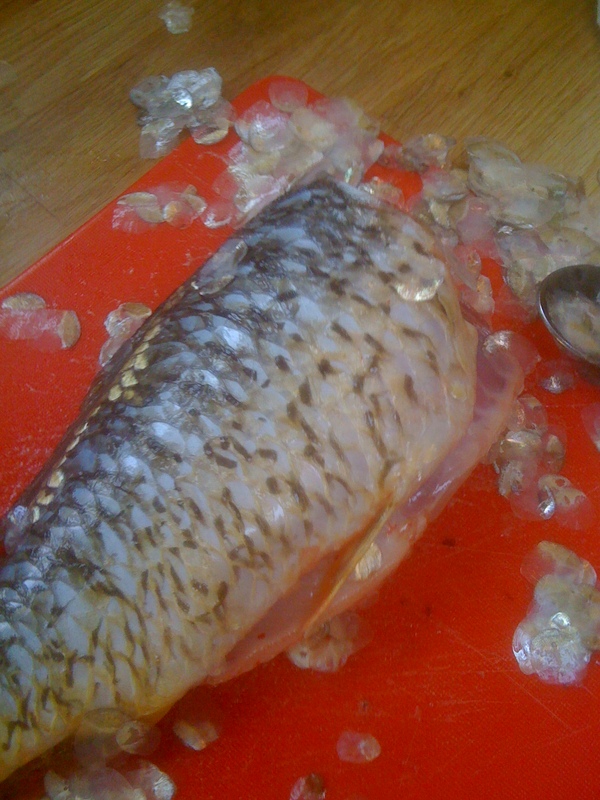 I seized the opportunity while my (not so keen on all this -) wife was out and I went to town de-scaling and filleting it. De-scaling was a bit of a mission and I wanted to ensure that none were left. I reckon a fish scale in a mouthful of food isn’t the end of the world, but certainly first time round I wanted the experience to be spot on. 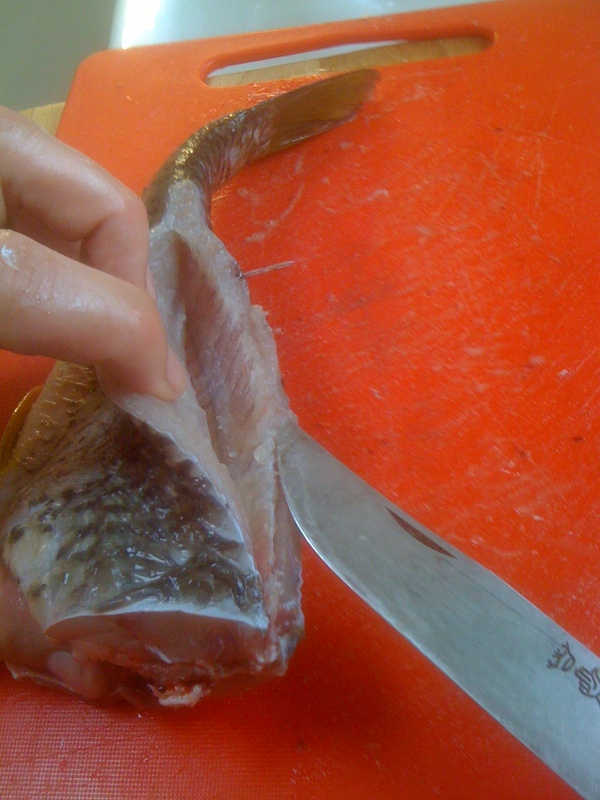 I removed the meat from the bones and cut around the tougher fin areas. It wasn’t long before I had two nice little fillets. 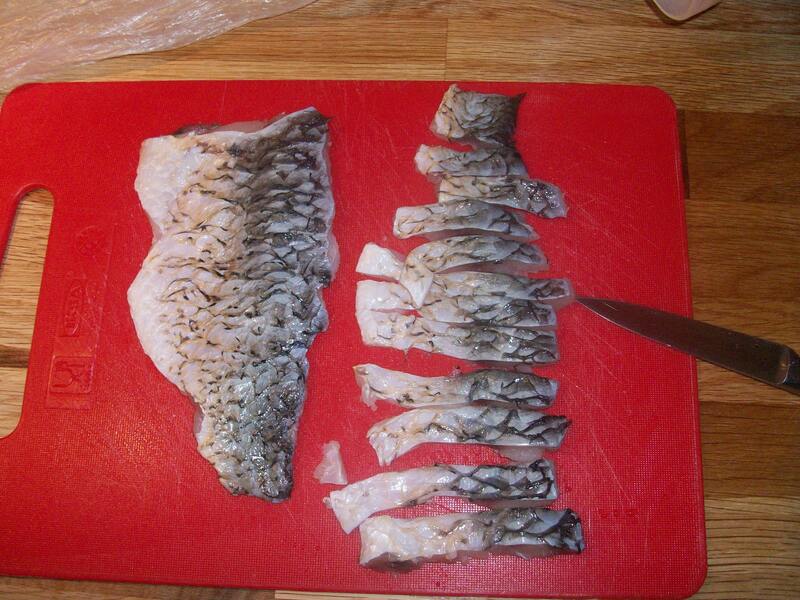 A week later I got the chance to eat my fish supper so once thawed I sliced it into strips. 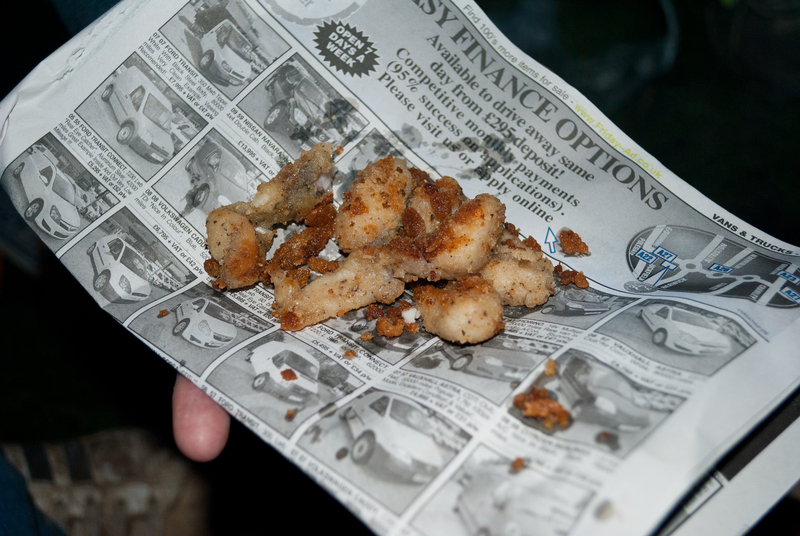 I covered the fish in milk, flour and then breadcrumb and seasoned with salt and pepper. Over some hot coals from the fire I heated some oil and dropped the chunks in. I love the angry reaction of the hot oil as you add food to it… Shallow frying them turned each piece a lovely golden crispy brown. So, at last, dinner time…. the moment of truth. How bad can it be? It was beautiful. Not just ‘OK’, not ‘alright but I wont do it again’… it was delicious! No muddy taste, no bones, no aftertaste… just crunchy tasty fish. I do encourage you to consider giving it a go if you can. Obviously don’t rob a fishery, but it shouldn’t be too hard to get one legit. It’s so easy and rewarding. Carp did not feature on this years Christmas table, but who knows, it might next year. Why don’t we consider eating more fresh water fish? This entry was posted in Eating Out, Fishing, Food, Something New and tagged Carp, fish supper, Fishing. Bookmark the permalink. Carp fried bits, like it- hope to try one day: used to fish when I were a lad and I think my rods etc are still in my mums loft….. It is a must do Nige! You may need some new hooks by now (barbless and rust free! ), but if a guy with limited ‘Schoolboy’ gear can do it….There must be somewhere close to you? Thanks for your comments.